Located in the Port Saaed area of Dubai, Al Jawhara Gardens is a 4-star hotel well-positioned for many of the city’s top attractions and shopping malls. 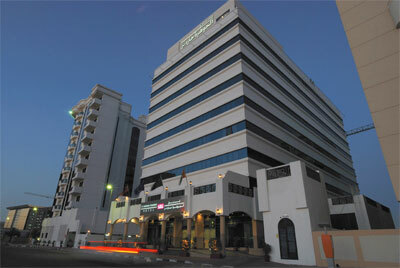 Al Jawhara Gardens Hotel is a part of Jawhara Hospitality, the first Sharia Compliant Hospitality group in Dubai. Al Jawhara Gardens Hotel offers spacious, neatly furnished and decorated rooms and suites in a colourful Arabic style. There are separate swimming pools exclusively for women and men. The hotel has a great choice of food and beverage outlets. Guests can enjoy international cuisine on a 24-hour basis, as well as a speciality sea food restaurant (seasonal) and a coffee shop. Al Jawhara Gardens Hotel is within easy walking distance of Dubai’s famous Deira City Centre Shopping Mall, and just a 4-minute drive from Dubai International Airport. Being a pure family hotel, no guest is allowed to consume or bring alcohol onto the hotel’s premises.